Throughout its 200-year history, Historic Rosemont Manor has embodied the graciousness of true Southern Hospitality. Rosemont is a fine old Virginia mansion set on a knoll facing east over the Shenandoah Valley to the Blue Ridge Mountains. Originally the 5,000-acre property was bequeathed to the first High Sheriff of Clarke County, George Horton Norris in the early 1800s. Norris built the manor, which he named “Rose Mont”, as a wedding gift for his bride, Jane Bowles Wormeley in 1811. It was constructed in the Georgian style of architecture popular at that time. The Norris family continued living at Rosemont until 1854, when Norris’s granddaughter married into the wealthy Tyson family of Baltimore, which was one of the largest producers of metal on the East Coast. They also produced some of the fastest racehorses in the nation here at Rosemont. 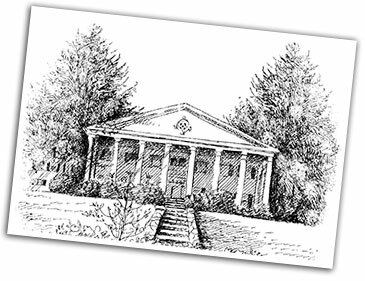 The Tysons added the Grand Portico, with its gabled pediment and fluted Doric columns, on east side of the manor house. The main entrance was moved there, and carriages delivered ladies and gentlemen dressed in Victorian finery for spectacular evenings of dining and dancing. In 1864, the War Between the States was in full force throughout the Shenandoah Valley, and the grounds at Rosemont became the focal point of the Battle of Berryville, with Northern troops assembling lines on both sides of the manor. To date, numerous Civil War relics have been excavated from the property. Rosemont remained in the Tyson family for nearly 50 years. Rosemont changed hands several times just after the turn of the 20th century and was then purchased in 1910 by New York attorney J. Low Harriman and his wife as their country home. The Harrimans added a large two-story wing to provide additional quarters for their frequent guests. They did extensive remodeling of Rosemont, changing the floor plan and adding the impressive two-story grand staircase. They also added a south extension onto the library and a sleeping porch above, as well as a sun room off the dining room. The Harrimans also added plumbing to the manor house, and many of the current bathrooms retain the original bath fixtures and tiling. The Harrimans sold Rosemont in 1917 to William and Anne Smith, who kept Rosemont as their primary residence until the late 1920′s. The Byrd family’s ownership began in 1929 when then Virginia Governor Harry F. Byrd, Sr. purchased Rosemont from the widowed Anne Smith, and added the detailed oak paneling in the dining room. As Harry Sr. continued his rise to political power as a U.S. Senator, the manor evolved into a haven for politicians, and the grounds became a landing pad for presidential helicopters. Harry Sr. lived at Rosemont until his death in 1966. Rosemont remained in the Byrd family until 1997, when it was purchased by Randy and Sue Jones from Northern Virginia. They began extensive restorations on Rosemont. The Joneses also continued Rosemont’s legacy of playing host to prominent politicians, community leaders and charitable fundraisers. Purchased by William & Barbara Genda of Clarke County in 2009, in part to keep it from being lost to development, Rosemont’s renovations were completed one year later and opened to the public for the first time in 200 years as an exclusive bed and breakfast and special events venue. In its first several years of business, Rosemont hosted hundreds of weddings and countless B&B, Corporate, and Manor House Tea guests. Now everyone can experience the same grandeur and solace of Historic Rosemont Manor as the many historical figures have over the years. In fact, many of Rosemont’s rooms and suites are named for the historical figures that visited Rosemont—Presidents Roosevelt, Eisenhower, Kennedy, Nixon, and Johnson; famed aviator Charles Lindbergh; physicist Albert Einstein; and military icon Admiral Chester Nimitz, just to name a few. Now you can add your name to this esteemed list. Want to hear more about the History of Rosemont? Click here for a complete history of this historic estate venue. To book your wedding, corporate event, overnight getaway, or Manor House Tea, call 703-879-5683 today, and make Rosemont a part of your history.